There’s a problem with following the crowd. The crowd is scared, which is why it finds safety in numbers. The crowd is ignorant, which is why it refuses to think for itself. The crowd is compliant, pulling anyone into line who gets too ambitious. The crowd is average, excellence is for individuals not sheep. The crowd is unremarkable, with everyone merging together in one big ugly mass. 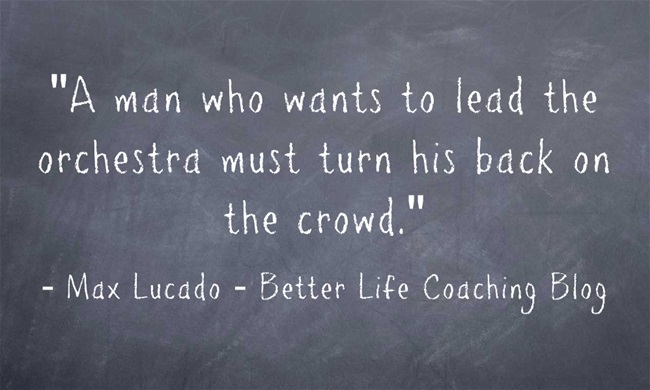 So don’t follow the crowd, they won’t take you where you need to go to make a difference in the world. Be courageous and take the risks required to make the most out of life. Keep learning, growing and developing new skills for the rest of your days. Be innovative, creative and entrepreneurial. Set high expectations for you own work and keep yourself accountable for delivering phenomenal outcomes. And be remarkable, remembering that you have a unique set of skills, perspectives and ideas that enable you to leave an indelible print on the world around you. It’s time to leave the crowd behind. It’s time to forge a path to greatness!